While we appreciate the concept of limited EV production for specific markets, using battery powered vehicles to replace liquid fuel vehicles on a mass scale is problematic. We have found our readers to be extremely informed about transportation technologies, yet few seem to have taken the time to understand all the variables and inter-dependencies of what the media and so many politicians are suggesting will be our future. The unit of measure for “Greenness” is not limited to the vehicle’s MPG. One must consider the impact a vehicle has on the environment from mineral extraction to recycling and if the technologies are sustainable and scalable for the long term. When gasoline was below $2/gal the American people demanded huge SUV’s and the US manufacturers were happy to build and sell them. This was less than a good idea as it narrowed the historic time line of the petroleum era. Now the American people are demanding EV’s and hybrids and the same companies are happy to build and sell them. Please ponder the amount of copper, aluminum, gallium, selenium, lutetium, lanthanum, neodymium, …, minerals needed to build the new National Smart Grid. Then consider there are 145 nations – now building National Smart Grids. Note: While aluminum is the most abundant metal in the Earth’s crust and the third most abundant element, its manufacture requires a great deal of energy which is why it is was one of the first metals to be recycled and also why most of the aluminum manufacturing facilities that were once in the US have closed their operations over the past few decades. Please ponder the amount of copper, aluminum, gallium, selenium, lutetium, lanthanum, neodymium, …, minerals needed to build the massive solar arrays. Then consider the world has manufactured Gw’s of solar panels already and projections are calling for 10,000 times the current install base. Please ponder the amount of copper, aluminum, gallium, selenium, lutetium, lanthanum, neodymium, …, minerals needed to build the hundreds of millions of wind turbines over the coming decades – utility scale and small wind units – essential for power generation as coal reserves diminish. China recently announced a target of 335Gw of wind turbines for the renewable energy needs of their own population by 2020. This goal will require 59,000 metric tons of neodymium. The world’s total volume of neodymium extracted and refined in 2009 was about 25,000 metric tons which was an historic high. Please ponder the amount of copper, aluminum, gallium, selenium, lutetium, lanthanum, neodymium, …, minerals needed to build the personal electronics for the emerging middle income markets of India, China, Russia, south-east Asian, South American and African nations. This total is 15x the middle income population of the US. Please ponder the amount of copper, aluminum, gallium, selenium, lutetium, lanthanum, neodymium, …, minerals needed to build the billions of cell phones and supporting communications equipment to support our economies and culture. There were 2.2 billion cell phones manufactured in 2009 alone and typically, less than 30% of cell phones are ever recycled. Please ponder the amount of copper, aluminum, gallium, selenium, lutetium, lanthanum, neodymium, …, minerals needed to build an EV car. Then consider that there are 2 billion vehicles on the planet with projections of 3 billion by 2020. Life expectancy of these vehicles is only 6-7 years (see EV’s and Hybrids are a financial gamble below), so over just 100 years that is 42 billion vehicles. Though to be responsible to future generations, we should be thinking and planning in terms of at least several hundred years. In the unlikely event we can raise the recycling of all EV batteries and mineral intense subsystems to over 90%, there is still a significant loss of usable minerals per 7 year cycle. There are heated discussions about published targets of 100 metric tons of terbium and dysprosium for the auto industry over the next 10 years as this will impact over 1,000 other industries and likely increase the price of these minerals by some factor. There is a battle brewing between Toyota and wind turbine manufacturers. Each Prius requires 2.2lbs of neodymium and Toyota is now consuming a significant percentage of the world’s annual extraction of this rare earth mineral. There have been about 2M Prius cars manufactured to date so this is 2,000 metric tons of ore. If this same volume were to be added to all EV’s and Hybrids and if these technologies were to be manufactured at large scale (>10M vehicles/year), that would require 20,000 metric tons – the world’s entire annual production volume. 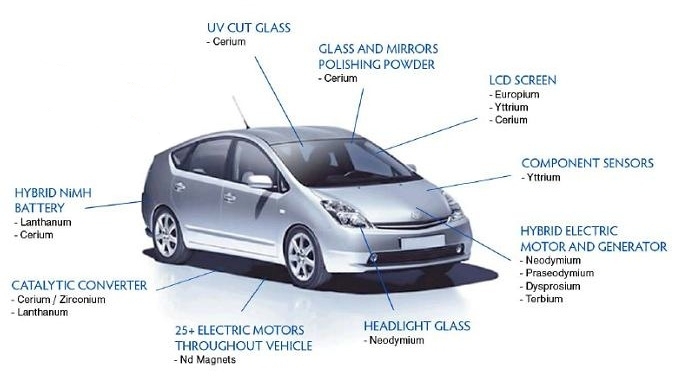 Jack Lifton, an independent commodities consultant and strategic metals expert, calls the Prius “the biggest user of rare earths of any object in the world.” Japanese manufacturing precision, especially Toyota’s, has often set the bar for the automotive industry. The Prius is an industry leader as the direct result of “extreme engineering” to maximize MPG performance based on their advanced material science and minerals selection. The current Prius design benefits from near open selection of minerals (the best choice regardless of cost and availability) so it is likely that future Prius models that are redesigned based on dwindling mineral reserves and higher mineral costs may offer lower performance numbers. So Peak Minerals will likely result in a “Peak Prius”. One week into the China-Japan REE spat, Japanese government-funded researchers announced a electro-magnetic system design utilizing ferret iron that can completely replace the neodymium used in the Prius. So the Peak Prius is here already. For perspective – this is not a 5% issue, but rather an order of magnitude (10x factor) issue in weight vs. efficiency for material science aspects of this vehicle’s engineering. These electro-magnets are not only 10x heavier than rare earth magnets, but they also require a great deal of electricity to operate which reduces the range of the Plug-in Prius before switching over to the internal combustion engine. The Prius is a relatively small vehicle so other larger hybrids and EV’s that are faced with the same challenge will require even larger electro-magnets and there will be an even larger energy demand from the batteries. This lower efficiency reduces and eventually negates the justification to manufacture EV’s and Hybrids in general. The Tesla EV engineers side stepped the rare earth minerals issue by using a more expensive, heavier and less efficient solution for their generators. While this decision makes the Tesla more attractive from a rare earth mineral usage perspective, we are reminded that the purchase price of the Tesla is well over $100,000 USD and a new owner can look forward to a $28K replacement lithium battery cost. These costs are simply not reflective of a large scale production solution. History shows us that building a new, large scale production industry based on a known limited resource will result in conflict and volatile markets. Rare earth laden EV’s and Hybrids are not sustainable for more than a few decades based on the current rare earth and heavy metal mineral reserves. Investing hundreds of billions of dollars industry wide in R&D and manufacturing and establishing an infrastructure for sales, maintenance and service (recharging) for such a short production period is not supported by traditional business strategies. Update – 2011-07-04: A Japanese university published a paper last month about “discovering” rare earth minerals on the ocean floor. Here is our review with links to the original paper and another review. When considering a sustainability decision matrix, we need to be responsibly planning for hundreds of years. One only has to review the increase in prices of various minerals over the past 5 years to understand the situation – most of the light and heavy rare earths have increased in cost by a factor of 3-20. The mineral extraction volumes necessary to manufacture billions of efficient EV’s over the coming decades are not available. Hybrids are little better with 2 separate systems. EV and Hybrid technologies require advanced electronics, huge electric motors, regenerative braking units, advanced transmissions, large and complex batteries and recharging technologies, …, all of these subsystems require far greater volumes of rare and heavy metal minerals which are less readily available and recyclable per vehicle than what is required to manufacture a comparable advanced diesel vehicle. Also, the multi-$T infrastructure needed to support EV and plug-in Hybrid vehicles will require a staggering amount of additional minerals and will compound the problem. As you may be aware from the numerous news releases and articles (11 different article links following), China has announced a new policy on Chinese mined minerals. Over past decades, China has purchased the majority of the mineral mines of the world including 95% of the world’s rare earth mineral production and most of these minerals are slated to support only the Chinese economy and are not intended for export in raw form or for export in products containing these minerals. The Chinese government has a goal that 50 percent of all new cars sold in China by 2020 will be battery-powered. China (as opposed to the rest of the world) now has the resources to make this possible. Keep in mind that while the US has mineral deposits, the business models for mineral extraction in the US vs. China are radically different. The national Chinese government is seizing control of their rare earth mines. This next point should make crystal clear the fundamental message of this article – The Office of the Chinese Minister for Rare Earth Minerals has already publicly acknowledged they expect their supply of heavy rare earth minerals will be depleted in 10-20 years at current extraction levels and estimated world demand for the next 10 years is 35x the levels of extraction from the past 10 years. Over the past several decades the global economy has created competition between industries and nations at a level never before seen in human history. What enabled this leveling of the playing field for world resources was real-time communication technologies, sophisticated transport logistics and cheap petroleum. While historians tag the year 1571 as the true beginning of the global economy, modern day economists are now suggesting that the world experienced “Peak Globalization” in 2007. From that point forward, regional economies will emerge due to the higher costs of transportation of goods and materials and also due to the national export restrictions of various raw materials. So the pricing models for goods and services in China in the near future will have less bearing on the pricing models of goods and services in the US. In 2008 when the price of petroleum moved above $130 barrel, the cost of manufacturing steel in China exceeded the cost of manufacturing steel in the US for the first time in decades. Iron ore has to be transported from Brazil to China, processed and then shipped to the US. The rising price of petroleum and minerals will result in radical shifts in our world economies. This fractured global economic model is already showing itself with China’s new policy on their mineral resources. This can be compared to a long list of US technologies and resources that cannot be sold to foreign nations due to the US State Department label, “In the Interest of National Security”. As the US has no rare earth mineral mines in operation today, it is reasonable to believe that the US Government – particularly the DoD – will fund the extraction of minerals in the coming years in the Interest of National Security. The DoE recently provided a grant of $70M to research and develop more efficient and environmentally sensitive extraction methods of rare earths from US mines. While such an effort will accelerate getting these mines back into operation (current projections suggest 6-8 years to extract and refine the first ounce of rare earths from the northern California mines), the environmentalists will undoubtedly raise arguments. This course of events will make for an interesting decision matrix for the environmentalists and those who simply wish to drive a Greener Car. It would be beyond hypocritical for the Sierra Club to support hundreds of square miles of tailing ponds in California, Nevada and Colorado for the extraction of rare earth minerals for EV’s and Hybrids while attacking the several hundred square miles of tailing ponds for the Canadian Oil Sands petroleum extraction. Even then, the sum total extraction of US rare earth mineral mines while in operation prior to 2000 was a few thousand metric tons year which is dismally small in the shadow of the current and projected demand of hundreds of thousands of metric tons per year. According to a new United States Energy Department report, the most important of all rare earth minerals for clean energy is dysprosium. As shown in the following chart, the price by April 2011 was $700kg, compared with $38kg in April of 2001. This is an increase in price by a factor of 18.4 times over 10 years. So what about the vast mineral reserves in Afghanistan and other countries? Since the days of Soviet control, it has been known this region was rich in minerals. The US and Allies have occupied this region for over 9 years and still today our military calculate the cost to move one gallon of diesel fuel from point A to point B to be over $100 based on the special vehicles and military escorts necessary to insure delivery. Extracting minerals in this hostile environment is out of the question for at least a decade. Many historians suggest the ultimate costs to occupy Afghanistan both financially and in lives was a major catalyst of the downfall of the Soviet Union. The US may learn the same lesson. There are also known mineral reserves in Africa, Australia and Greenland to name a few. Production will increase over the coming years – possibly for the next 2-3 decades, but all of these reserves too will peak and decline. The concept of moving people around with battery power is simply not sustainable. While “rare earth” minerals are actually not that rare to locate, their name refers to the percentage of target ore that can be extracted per ton of material processed and “rare” is a proper label. Expand the concept of Peak Oil and start thinking about Peak Everything. We have to be smart in how we allocate the remaining resources of this planet. Please consider that only 67% of petroleum is used for the transportation industry. The balance is used for an incredibly wide array of applications including plastics, polymers, clothing, pharmaceuticals, packaging, … While many products can be made from bio-oils, in some cases, the quality and characteristics of the products made from petroleum are far superior to similar products made from bio-oils as the result of the more complex carbon chains within the chemistry of petroleum. We must reserve some amount of petroleum for these special uses for future generations. In a 2nd Q, 2010 report, Lord Ron Oxburgh, a former chairman of Shell, wrote that “It is pretty clear that there is not much chance of finding any significant quantity of new cheap oil. Any new or unconventional oil is going to be expensive.” He went on to quote King Abdullah of Saudi Arabia commenting on a minor new oil find: “Leave it in the ground…our children need it.” The same wisdom should be applied to a list of critical minerals. We have reviewed reports that suggest that mass production with the target of replacing the vast majority of liquid fueled vehicles with EV’s and Hybrids, will deplete a list of the earth’s minerals within 50 years. If people care that their children, grandchildren, great-grand children, …, will be able to enjoy a lifestyle that includes the minerals from which we have benefited during our lifetime, then we have some decisions to make now. Our transportation future must be kept as simple and as close to 100% recyclable as possible. EV’s and Hybrids are a financial gamble past 100K miles (currently, the Volt, Leaf and Tesla warranties end at 100K miles while the warranties of the Toyota Prius ends at 60K and the Honda Insight tops out at 80K). As Prius is the hybrid leader, we will include that the Prius battery warranty beyond 60K miles is prorated which means that if your battery dies at 90K for example, you will pay about $3K and they will cover the remaining $1K replacement cost. This risk is exasperated if V2G technologies are incorporated as the additional power cycling shortens the life of the battery and a list of other components. Consider the replacement costs of the various subsystems for these vehicles include $3K-$28K batteries, $9K-$15K transmissions, $5K-$9K on-board computers, $4K-$7K electric motors/generators, $2K-$6K replacement of regenerative braking systems, etc. This will sorely impact the resale value of these cars once the general public understands these risks. These repair costs are radically different than the life cycle costs of an advanced diesel technologies vehicle as diesel powered vehicles have a proven history of reaching 300K miles with only regular maintenance costs and $100 batteries. This advanced diesel cost model results in 1/2 to 1/3 the environmental impact and recycling compared to EV’s and Hybrids. The mineral extraction requirements, manufacturing, recycling and longevity of a vehicle are key metrics for “Greenness”. There are good reasons why advanced diesel cars won the Green Car of the Year Award in both 2009 and 2010. It has been presented that EV’s are 85% efficient while liquid fuel vehicles may be as low as 30% efficient. This comparison would have significance only if both energy source options are limited; for example EV’s vs. petroleum powered vehicles. However, biofuels are virtually without production volume limits and current projections support production costs for biodiesel resulting at $1-$2 USD gallon at the pump in the near future (10-15 years). Advanced diesel engines typically achieve a 45% efficiency level and with new vehicle-stop/engine-stop technology, some have ratings as high as 80%. Also, EV’s will be primarily recharged from fossil fuels for the coming years and the development of Green Energy power plants such as solar and wind to recharge EV’s in the future will require still more minerals. Building hundreds of billions of liquid fuel vehicles (several billion per 15 year cycle) is possible with the remaining mineral resources and those cars will run on a virtually unlimited supply of biofuel. However, it can be argued that EV’s and hybrids are to some degree, “burning” the minerals themselves as 100% recyclable batteries and mineral intense subsystems are not achievable targets. We have research statistics to estimate the average number of minutes a US citizen spends in a car per day and 31 minutes/day was a common conclusion. The concept that people would consciously make the decision to deplete the supply of critical minerals needed for wind turbine manufacturing and other renewable technologies for a vehicle that they only drive for 31 minutes per day for a 7 year life cycle does not seem like a responsible trade-off. Such a turbine, in a good wind resource, with the same amount of minerals is likely to generate Green Energy for 10-14 hours per day for 30 years. The US electric grid will not support a complete replacement of ICE vehicles with EV’s and plug-in hybrids today or probably in 20 years. While some studies are suggesting there is sufficient capacity available from our power plants, it is the distribution grid capacity to the houses, service stations, etc. that would require the multi-$T upgrades. If we compare charging an EV or Plug-in hybrid to filling a car with liquid fuel: It takes about 6-8 minutes to put 630 KWh of energy into the tank, sufficient to take an advanced diesel powered car 700 miles (most advanced diesel vehicles offer a 600-2,000 mile range from a single tank of fuel). To put 630 KWh into a battery in 6 minutes would be equivalent to a charging rate of 12.6 MWh. This is roughly x35 the total electric capacity available in most US homes and the EV system is obviously not engineered to handle this load – EV manufacturers consider a “fast charge” of just 90 Kwh to be 3-5 hours. Even with “fast charging” a typical EV (Leaf or Tesla), a 700 mile trip would require more than 24 hours just for the recharging. Again this is 24hrs vs. 6-8 minutes for the energy loading for the same distance traveled in a comparable vehicle. EV owners on the road and even at home to some degree are at the mercy of the other devices drawing power and other EV’s being recharged from the same power distribution unit (PDU) at the same time. EV recharging stations will not be engineered for 100% rated delivery at 100% load usage – the capitalization would be too expensive. Rather, the maximum amps that can be delivered to a single vehicle will be effected by the number of cars being recharged at the same time from the same transmission circuit. EV owners will get use to longer charging times when there are more cars being charged at once. All batteries experience energy loss even when sitting idle – unused. This is common knowledge and common experience. As batteries age, this energy loss is more severe. The advertised cost of operating EV’s and plug-in hybrids is based on the performance of new batteries, yet the wary owner will realize that within a few years this energy dissipation is ever increasing to the point where a significant percentage of all the electricity they are paying for in their daily charges is simply dissipating away. That is the point when they will be faced with the option to purchase a new battery at $3K-$28K, stop charging the battery in the case of a plug-in hybrid or to replace the vehicle. We often read about business models where EV vehicle drivers would pull into a service station and swap out their depleted battery with one that is already charged with the concept that they can be on their way – cross-country – within 20-30minutes – just slightly longer than refueling an ICE vehicle. This concept is simply ridiculous. Let’s take a new Tesla Model S for example. So you want to drive from L.A. to NYC and you have plotted out these battery replacement service stations along the way. You started out with a $29,000 new battery in the new vehicle, but somewhere south of Las Vegas, you replaced that battery with a used unit with a market value of maybe $8,000. That battery might only last for 1/2 the range of your new battery that you started out with. Your vehicle and your wallet just experienced a $21,000 re-evaluation and now you are driving on a power source that is unknown and may leave you stranded in the desert 100 miles from help with no cell service to even call for help. The above concern may be off-set slightly with the use of solar panels on the car itself such as with the Fisker Karma. However, this would require parking the vehicle in the open sunshine rather than a garage or car port. People who live in the desert, snow belts and rainy climates will have strong feelings about this option. Climates that experience frequent hail storms will also be a factor in where people are willing to park their $40K-$200K cars. Energy distribution on the electrical grid typically has a double digit line loss between the power plant and the home. This inefficiency needs to be calculated into the true energy cost of operating these electrified cars regardless of whether the car owner is paying for the line loss. This is far from Green. Advanced battery technologies have the very real potential of exploding in a collision. To protect our fellow drivers and emergency response service personnel, all vehicles that contain these battery technologies need to be well labeled with large warning stickers on all surfaces that the vehicle contains a battery that may explode in a collision or if the jaws of life are used in the wrong place. In a serious vehicle accident, fluids are leaked – and in some cases sprayed – out on the road, road sides, on other vehicles, on drivers, on passengers, … The chemistry of a lithium battery is rated as “low-toxic” which still requires a licensed HAZMAT cleanup. Actually, the current battery in the Prius is rated “high-toxic” and is extremely dangerous. This is a serious health risk and is not a desirable solution to embrace. In comparison, an advanced diesel vehicle in the future will use B100 biodiesel which is rated non-toxic (1/10th as toxic as table salt) and can be hosed off with just water with no ill-effects. Over the coming years, antifreeze will again be sourced from glycerin (99.9% pure) as it was before WWII, so future diesel vehicles will be far less toxic than EV’s and plug-in hybrids. Replacing liquid fueled vehicles with electric powered vehicles directly increases the most health impacting emission particulates into the air and our oceans – heavy metals from coal burning power plants. So while the over-all volume of emissions from EV’s is lower than gasoline and petroleum diesel vehicles, US power plants are primarily coal powered and so an increase in electricity generation for EV’s is worse from a health perspective than emissions from 2nd generation feedstock sourced biodiesel powered vehicles by 3 orders of magnitude (the emissions of one EV that is recharged from a coal powered plant have a greater negative health impact than thousands of advanced diesel vehicles burning B100). Very simply, until EV’s are only charged from renewable sources, they will be the direct catalyst for the health issues and deaths of many more people. Please consider a migration to EV’s shifts the pollution from a highly regulated, very low emission source, the car engine, to one that is much less regulated and much more polluting in most cases. Since most power plants in the country use coal and they produce considerably more pollutants than a gasoline or diesel car engine. It’s a poor, uninformed choice for a true environmentalist. The combustion of coal, like any other fossil fuel, is an exothermic reaction between the fuel source and usually oxygen. Coal is made primarily of carbon, but also contains sulfur, oxygen, hydrogen, and nitrogen. During combustion, the reaction between coal and the air produces oxides of carbon, including carbon dioxide (CO2greenhouse gas), oxides of sulfur, mainly sulfur dioxide (SO2), and various oxides of nitrogen (NOx). Because of the hydrogen and nitrogen components of coal, hydrides and nitrides of carbon and sulfur are also produced during the combustion of coal in air. These could include hydrogen cyanide (HCN), sulfur nitrate (SNO3) and many other toxic substances. Coal is the largest contributor to the human-made increase of CO2 in the atmosphere. Further, acid rain may occur when the sulfur dioxide produced in the combustion of coal, reacts with oxygen to form sulfur trioxide (SO3), which then reacts with water molecules in the atmosphere to form sulfuric acid (see Acid anhydride for more information). The sulfuric acid (H2SO4) is returned to the Earth as acid rain. Flue gas desulfurization scrubbing systems, which use lime to remove the sulfur dioxide can reduce or eliminate the likelihood of acid rain. However, another form of acid rain is due to the carbon dioxide emissions of a coal plant. When released into the atmosphere, the carbon dioxide molecules react with water molecules, to very slowly produce carbonic acid (H2CO3). This, in turn, returns to the earth as a corrosive substance. This cannot be prevented as easily as sulfur dioxide emissions. Coal and coal waste products, including fly ash, bottom ash, and boiler slag, contain many heavy metals, including arsenic, lead, mercury, nickel, vanadium, beryllium, cadmium, barium, chromium, copper, molybdenum, zinc, selenium and radium, which are dangerous if released into the environment. Coal also contains low levels of uranium, thorium, and other naturally occurring radioactive isotopes whose release into the environment may lead to radioactive contamination. While these substances are trace impurities, enough coal is burned that significant amounts of these substances are released. Heavy metal refers to any metallic chemical element that has a high density and is toxic or poisonous at low concentrations. Coal contains many heavy metals, as it is created through compressed organic matter containing virtually every element in the periodic table – mainly carbon, but also heavy metals. The heavy metal content of coal varies by coal seam and geographic region. A variety of chemicals (mostly metals) are associated with coal that are either found in the coal directly or in the layers of rock that lie above and between the seams of coal. The U.S. EPA Office of Transportation and Air Quality uses a testing method labeled, “worst case mode” to determine the true emissions of any vehicle. To explain the basic premise by example: Consider a diesel powered vehicle that will run on B100 with emissions of “X”. As with all vehicles operating on U.S. roads, it must be tested for its EPA emission certification. If this vehicle has the potential of running on petro diesel, then the EPA will only test and rate the emissions of that vehicle as if the vehicle would only be operated on petro diesel which would present far less desirable emissions ratings (B100 burns 87% cleaner than petro diesel before additives – 97% cleaner with additives). These undesirable petroleum sourced fuel emissions test results dictate the EPA requires an emissions control system for this diesel vehicle – based on the petroleum diesel only emission tests. Actually no B100 fuel emissions testing is ever performed. This “worst case mode” model has cost the U.S. public in the range of $2T in the purchase of higher volumes of fuel over the past 10 years in that the rest of the world’s industrialized nations migrated to diesel and adopted biodiesel fuel mandates over a decade ago and this “worse case mode” regulation has kept the U.S. primarily on gasoline. To apply this “worst case mode” model to an EV and plug-in hybrid as convention would require, the emissions of an EV are based on the energy generation source. Since EV’s are mobile, their emissions per this EPA methodology must only be rated as if the electricity generated for that EV (not limited to the electricity delivered) is sourced from the worst emitting coal plant in the U.S.. While many will balk at this argument, ETC Green engineers and attorneys are having these conversations with Administrators of EPA’s Office of Transportation and Air Quality in Ann Arbor currently and the memos include references to a multi-$T Class Action litigation to motivate the EPA to adopt more responsible units of measure. EV’s and plug-in hybrids have marginal power levels and marginal reserve energy stores. They are specifically engineered this way for more miles per charge. The range differential between a driver only with no baggage vs. a fully loaded advanced diesel vehicle is 10-15% less miles. However, the range differential of an EV or plug-in hybrid vehicle between a driver only vs. a fully loaded vehicle has been tested to be 30-40% less miles. While running the A/C or heater in a diesel powered car has very little impact to the MPG, reports show running the A/C or heater in an EV and plug-in hybrid radically effects the range – as much as 20% (depending on the configuration variables of the EV or plug-in hybrid). Also, while the outside temperature (not road conditions) effects the efficiency of a liquid fueled vehicle by 10-15% at the extremes, test data shows the same extreme temperatures will effect the range of an EV by 20-40%. All of these related performance variables will result in a significant increase in stranded drivers out on American highways miscalculating their driving range. While running out of gasoline is easily solved with a 5 gallon container, ponder the complexities of tow trucks and rescue vehicles having to carry a power inverter with multiple couplers with the capability to recharge every type of EV car enough to get it to a service station that serves EV’s and plug-in hybrids. These stations are, and will likely continue to be, extremely few and far between. For the past 2 decades, Chinese mines have produced over 95% of the world’s rare earth minerals. The official miner death count reported by the Chinese government for 2009 is 2,640 though it is suspected that the actual death count is some factor of this number with human rights activists suggesting numbers as high as 18,000 in 2009 alone (this includes the 2009 death of retired miners primarily from black, gray and white lung disease and also the people who were living in the immediate areas of the mines). In the coming years as quality of life and safety issues continue to gain ground in China’s mining operations, the costs of extraction and therefore the cost of the minerals will increase radically. Chinese rare earth mines have the fewest environmental regulations of any in the world. The resulting tailing ponds cover literally hundreds of square miles of lands and surrounding farms and villages have been abandoned due to contamination of the water table and the air emissions from the processing plants (see video above). These conditions are truly an embarrassment to China so the government has initiated super-site clean up efforts on these large expanses of land. Ultimately, the cost of these clean up projects will be added to the cost of the minerals so the price of rare earth minerals will radically increase yet again. When a plug-in Hybrid’s battery runs low, the liquid fuel engine kicks in and at that point, that engine has to also move hundreds of pounds of dead battery. Even worse, if the on-board computer is set to recharge the battery, then the engine is moving the car, its contents, the dead battery and recharging the battery. To apply this energy model to the Chevy Volt, the battery with structural framework and recharging electronics weighs over 700lbs. So when that battery runs out of power, the vehicle in recharging mode will achieve about 24mppg (Miles Per Petroleum Gallon). If not in recharging mode, the vehicle achieves about 34mppg. Why not drive an advanced 4 door sedan diesel powered vehicle that is engineered to run B100 and achieves 45mpbg (Miles Per Biodiesel Gallon) and never use any petroleum sourced fuel? This is more Green by some factor. ETC Green’s AWD, full-sized SUV, Jeep Grand Cherokees achieve 52mppg, provide lower emissions than a Toyota Prius and we never have to plug them in. The cost of maintaining our roads and bridges in the U.S. is increasing while our vehicles are becoming more efficient. For nearly 100 years the tax structure that has supported these roads and bridges was based on a percentage of the fuel sales. This business model no longer works and is contributing to the deficits in our state and federal budgets. It is being suggested that a new tax structure be adopted that taxes the number of miles traveled paying attention to the weight of the vehicles being taxed. Since an EV weighs far more than a comparably sized advanced diesel vehicle due to the on-board batteries, the EV will cause more wear to the roads and therefore should be taxed at a higher rate than a lighter weight vehicle. This is yet another economic argument against EV’s and plug-in hybrids. The purchase of an EV or plug-in hybrid without purchasing a high capacity charger makes little sense in that a full charge from complete depletion from a 110V regular outlet is over 24 hours for some of these vehicles. Therefore, when calculating the cost of ownership of an EV or Plug-in hybrid buyers need to include the $5K-$120K purchase and installation of the high capacity charging unit. We now have the records and history of 5 high capacity charger installations that also required that the neighborhood PDU (Power Distribution Unit) also be upgraded. Based on the Public Utility Commission regulations that governed 2 of these particular installations, the cost of the PDU’s were then distributed and billed to all the residents being serviced by these PDU’s. Since no other resident on these PDU’s had any interest in purchasing an EV vehicle, they were understandably upset about having to help pay for their neighbor’s installation of his high capacity charger. In both cases, the neighbors hired attorneys and filed civil complaints against their respective EV and plug-in hybrid owning neighbors to secure compensation to off-set their increased electric bills. In one case the settlement was over $100,000 – which was twice the cost of the Chevy Volt and high capacity charger. When faced with this cost, the Volt owner offered to get rid of the vehicle and charger and requested the utility company replace the new PDU with the original. The utility replied with the cost estimate to do so – another $30K which would be distributed back out to all the residents of the PDU. Consider that as more EV’s and plug-in hybrids are purchased in more densely populated and older grid technology services areas, these types of situations will become quite common. As anyone who understands the power grid will attest to, this PDU/1st high load demand scenario will be routine and is one of the most significant challenges a large scale migration to EV’s is facing. We have reviewed one estimate for the total national grid upgrade cost for just a 50% EV vehicle fleet replacement at $14T (we thought it interesting that this is the same as the current U.S. National Debt). Anyone considering the purchase of a Tesla, Nissan Leaf or Chevy Volt should have a long discussion with their insurance agent. The repair cost actuarial models for EV’s and plug-in hybrids are very different than a liquid fueled car. A moderate accident that damages the battery compartment will likely total the car as the replacement cost of the batteries exceeds the value of the rest of the vehicle. This higher initial purchase cost and investment exposure will increase the insurance premium and while government incentives radically reduced the initial cost of the car, there is no government incentive to help with the repair costs so the insurance company has to price their premiums accordingly. By current national statistics, less than 20% of the US population has and uses their garage for daily vehicle storage. Recharging an EV or plug-in hybrid while in a driveway or car port or apartment/condo parking space or in an unsecured office space is a bad idea for a list of reasons – liability of children in the neighborhood, the potential of being shocked or killed in rain, sleet, ice, snow, someone hijacking the power cord to charge their EV, people simply tripping over the cord between the charging unit and the vehicle, etc. The advertised cost of operating an EV and plug-in hybrid typically includes average residential electricity rates – $.08KwH, yet we have reviewed business plans for service stations and recharging centers and none of them list electricity sales at below $.50KwH and many are over $1.00KwH. This is equivalent to paying $24-$48 per gallon for gasoline based on the ratio between residential electric rates and what the AAA projects will be the common highway charging station costs. While all replacement car parts cost more than their new manufacturer installed costs, EV’s and plug-in hybrids currently have the initial cost advantage of being government subsidized. If you are considering owning one of these vehicles, you may wish to get a complete listing of parts costs before purchase in writing from the Dealership. Parts and subsystems do fail and based on the rapidly rising cost of rare earth minerals, the replacement parts may double or triple in cost during the period of your ownership of that vehicle. Have you researched the towing capacity of a Chevy Volt, Nissan Leaf or Toyota Prius? Towing any sized trailer is not recommended. An advanced diesel powered car with similar MPPG (Miles Per Petroleum Gallon), will typically have a 1,000-4,000lb towing capacity. And keep in mind that these advanced diesel vehicles can run on 20%-100% biodiesel so they are far more Green and biodiesel is made in the USA. We all experience emergencies from time to time that require us to be somewhere ASAP. In a regular ICE vehicle, refueling is a few minutes and you are on your way. With an EV, a full charge requires several hours. How many times have you thought you plugged in your cell phone and discovered the next morning it had not been plugged in? Ponder the household rule of “Who ever uses the car last must plug in the car”. How long will it be before the first Family Court Judge hears the argument, “He constantly forgot to plug in the car your Honor, so I frequently had to take a taxi to work” (and the car would then be charged during the day which is a higher cost electric rate period). Based on the current rate of consumption in 2010, scientists estimate that “Peak Phosphorus” will occur in 30 years and “Reserves will be depleted in the next 50 to 100 years.” At that point, the readily available remaining phosphorus resources will be capable of sustaining only a small percentage of the world’s 7 billion population. A more recent report from the Global Phosphorus Research Initiative (GPRI) – 2010-09, suggests the current phosphorus reserves will support current consumption for over 300 years. One should note that the price of phosphorus has increased by 800% over the past 5 years however and US Government mandates have increased the recovery efforts of phosphorus in waste water treatment facilities. Many if not most of the major cities in the US dump their treated waste water into rivers or directly into our oceans. The phosphates contained in human waste are therefore directly or indirectly delivered to the oceans along with the run-off of agricultural fertilizers where micro algae consume this material and sequester these critical minerals on the sea floor (see “Crude” – The Incredible Journey of Oil – 2007 Documentary). The logistics of “mining” the mineral rich micro algae miles deep and miles out in the “Dead Zones” off the US coastlines and at the mouth of the Mississippi river would be challenging. Many nations around the world are beginning to capture these minerals as a part of their waste water treatment processes. Robert U. Ayres has identified concepts of the inter-dependencies of nature – biological, mineral, energy conversion, … and collectively assigned the label “Industrial Metabolism“. We can learn from these inter-dependencies and cycles as they provide solutions to many of our current challenges. About 5 years ago, one of our ETC Green engineers filed a patent for the pasteurization of human and animal waste specifically to be able to recover the phosphates directly into micro algae processing facilities from the waste water treatment plants. So, not only will biofuels from micro algae sustain ground, air and sea going vehicles for at least several hundred years, but this system and infrastructure will also provide the mechanism for sustained agriculture in that the husks of the micro algae that have absorbed these minerals including phosphorus, will then be used as recyclable agricultural fertilizer. Also, it is important to understand that every ton of micro algae grown absorbs 2 tons of CO2 and that virtually every drop of petroleum started out as micro algae. Basically, the choice to use biofuels over EV technologies as the primary infrastructure for transportation is committing to operate within the Industrial Metabolic cycles that have evolved for billions of years. No one is seriously suggesting that commercial and military aircraft and ocean going ships will ever migrate to battery powered electric motors. Moving ground transportation to EV’s dilutes the R&D and capital funding resources to establish a new transportation infrastructure to replace petroleum. EV’s have a place, but we should not think of them as the dominate solution to replace the current 2 billion vehicles on the planet. Such a strategy would certainly displace both the investment and focus of the biofuels infrastructure solution which at once solves the transportation fuel problem, creates a more sustainable agricultural cycle, provides a low cost substitute for the majority of petroleum products and reduces CO2 which will slow and may eventually reverse global warming. As four of the last five economic recessions, including the current recession have been the direct result of petroleum pricing, this solution also stabilizes world economies. It can be argued that solutions which demand massive volumes of minerals such as EV and Hybrid technologies actually contribute to world conflict based on the limited and dwindling supply of raw materials necessary to manufacture and sustain those rare mineral intense infrastructures. Please ponder that within a few years, the big SUV’s and high performance cars will return and people can own and drive them guilt free on renewable fuel with a zero or even negative carbon life cycle and extremely low emissions. Everyone today seems so focused on MPG, yet this unit of measure is outdated. If the fuel is sustainable, economical and environmentally friendly, then MPG is not that important. Actually, if vehicles were running on B100, then lower MPG is more desirable as it better supports our economy. ETC Green Engineers are working with the EPA and DOT to suggest a new unit of measure – MPPG (Miles Per Petroleum Gallon) so people have a better understanding of the performance of the vehicle. There are now 4 micro algae to biodiesel firms that are in production generating 14,000 gallons/acre/year. Calculating at only 10,000 gallons/acre/year and producing enough transportation fuel to provide 100% of the fuel used by the US in 2009 (converting to the higher energy density of biodiesel) results in less than 12 million acres of land. Corn for ethanol is currently using 28 million acres of prime US farmland generating about 300 gallons/acre/year and biodiesel from soy was until recently, using over 20 million acres of farmland producing only 50 gallons/acre/year. Every major petroleum company in the world has invested heavily into this emerging micro algae industry with a growing presence in the micro algae to biodiesel research symposiums and commercial conventions while these petroleum firms have also radically reduced their funding for petroleum exploration though petroleum demand continues to rise. There are also now biodiesel production contracts in place between “big oil” and micro algae to biodiesel companies. UOP, the world’s leading liquid fuels refining engineering company, has embraced these 2nd generation biofuel feedstocks and are leading the migration to the new infrastructure. Favor high yield biofuel crops, replace virtually all engines with advanced diesel technology targeting B100 fuels and retool the petroleum refineries for maximum diesel yield production. Blue skies – Green fuel! While our road to sustainable transportation fuels looks promising, here is even more good news, our best and brightest are on the right path with truly renewable baseload grid energy from the sun and specifically from biodiesel production. As the petroleum age fades into history with the end of the coal age looming, the new world economies will evolve rapidly and we must find and embrace these environmentally responsible solutions. R&D funding into biofuel infrastructures will provide long term solutions for transportation and energy production that mineral based technologies such as EV’s and Hybrids are unlikely to ever achieve. Are you driving your last gasoline powered car?